After driving the minibus home, I set about trying to fit it in the garden as this was the only place I could park it. However there was a small problem, it was too long by about 18 inches! Oh, okay, I need a plan. At the back of the minibus was a step which stuck out from the vehicle by about a foot. 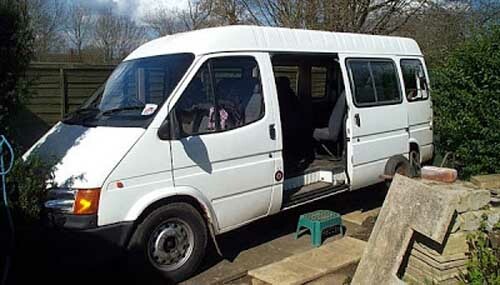 The step had seen better days, so removing it to reduce the overall length of the minibus seemed like the obvious solution – so that’s exactly what I did. And after a bit more measuring, tree trimming and the removal of the back gates, I managed to squeeze the minibus into the garden. The first job to do on the minibus was to try and fix the gearbox. I know very little about automatic gearboxes and I needed a bit of help. So I did a search for Ford transit automatic gearbox problem and got lead to a Ford Transit Van forum. I posted my problem on the forum and waited for a reply. Within an hour someone had answered me and gave some suggestions of things to check. And as luck would have it, someone else on the forum lived nearby and offered to pop round and help me out. Excellent! Well to cut a long story short – after trying a few things, the diagnosis didn’t look good and the minibus would still only go from 1st to 2nd, no 3rd or overdrive. So it looked increasingly likely that the only options I had, were to get the gearbox repaired by a professional (expensive), find a replacement (expensive), or swap it with a manual gearbox (expensive). The chap I bought the minibus from had told me that he had attempted to fix the gearbox. He’d also assured me that he had tried all the simple and cheap options like changing the oil and filter etc. and the only real choice left was to replace the gearbox. When I was checking the pipes I noticed that there wasn’t any vacuum getting to the gearbox and found that one of the non-return valves had been fitted the wrong way round. So I turned it around which then restored the vacuum. I took the minibus for a drive and to my amazement, another gear appeared. Yippee! After a bit more tweaking and replacing all the vacuum pipes the gearbox was working perfectly with all gears present. What a relief that was! I got quoted a £1000 from one scrap yard for a replacement transit automatic gearbox. Just imagine how good it felt to fix mine for £20. Happy days! So if you’ve got a Ford Transit automatic gearbox problem, check your vacuum non-return valve and pipes first!